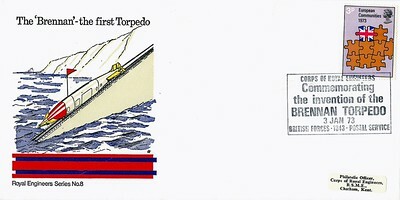 A set of numbered covers issued by the R.E. to mark important moments in Corps History. Date: 6 March 1972. Title: Bicentenary of The Royal Engineers in Gibraltar 1772 -1972. 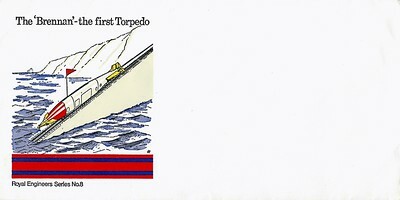 Type: First Day Issue - commemorative cover. 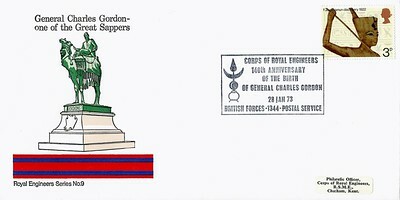 Stamps: 3 x Gibraltar commemoratives, "Bicentenary of the RE in Gibraltar", 1ᵖ, 3ᵖ and 5ᵖ, issued 6 March 1972. Cachet: The Freedom of the City of Gibraltar to the Royal Engineers born on the rock in 1772. Special Handstamp: R.E. Bicentenary Gibraltar BFPO 1772, RE Cypher, Sketches of 2 soldiers in uniform. Variant: Signed by Note: The BFPS number 1772 commemorates the year when the R.E. 's were first established on Gibraltar. Date: 6 March 1972. 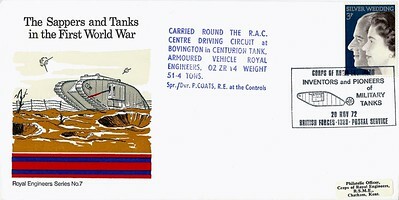 Title: Bicentenary of The Royal Engineers in Gibraltar 1772 -1972 - Back of envelope. Date: 6 May 1972. Title: Centenary of The Football Association Cup 1872-1972. Special Handstamp: F.A. Cup Final Centenary Year 6 May 72 - Sketch of the old Wembley Stadium and the F.A. Cup. Date: 6 May 1972. Title: Centenary of The Football Association Cup 1872-1972. Error: Print run misaligned. Date: 6 May 1972. Title: Centenary of The Football Association Cup 1872-1972. Blank cover - No handstamp or stamp. Date: 13 September 1972. Title: Military Communications - Landline to Satellite Royal Engineers to Royal Signals. 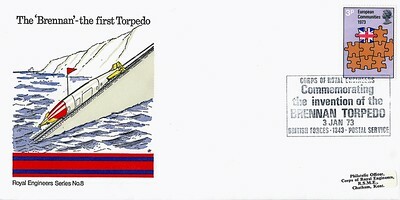 Type: First Day Issue - Commemorative cover. 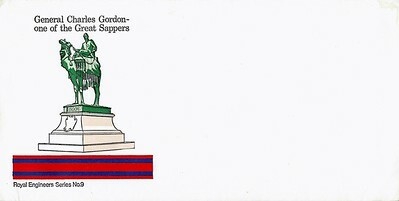 Stamps: 2 x commemorative: 3ᵖ "Microphones", 5ᵖ "Oscillator and Spark Transmitter", issued 13 September 1972. Special Handstamp: Corps of R.E. 75th Anniversary of Adoption of Wireless in the British Army BFPO 1326. Date: 3 January 1973. Title: The 'Brennan' - The First Torpedo. Printing fault: The colour blue is misaligned. Date: 3 January 1973. Title: The 'Brennan' - The First Torpedo. Blank cover: No stamps or cachet on cover. Date: 28 January 1973. Title: General Charles Gordon - One of the Great Sappers. Blank cover: No stamps or cachet on cover. Title: Centenary of The Football Association Cup 1872-1972. Blank cover - No handstamp or stamp.